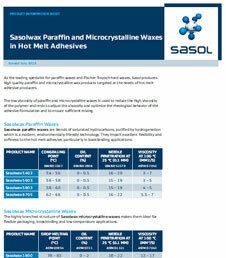 Sasolwax 6705 by Sasol is a paraffin wax designed for use in hot-melt adhesives. It is a blend of saturated hydrocarbons, purified by hydrogenation. It imparts excellent flexibility and softness. Used particularly in bookbinding applications.